The Maumee River flows through northwest Ohio into Lake Erie. 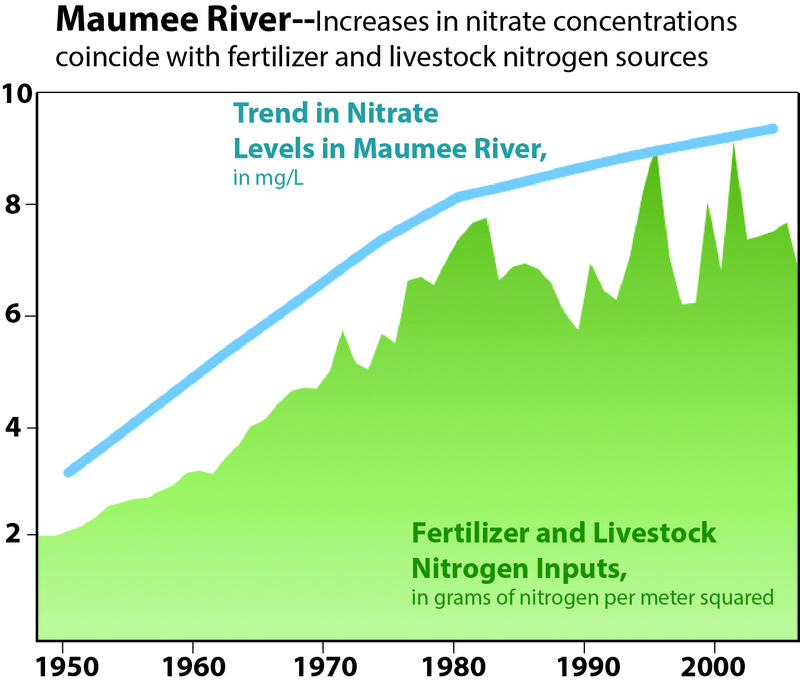 Nitrate concentrations in the Maumee River increased rapidly between 1945 and 1980 as nitrogen inputs from fertilizer and livestock increased. Since 1980, changes in nitrate levels have been much smaller because the nitrogen inputs leveled off. Data from Stets and others (2015). A recent U.S. Geological Survey (USGS) study provides a rare glimpse into how nitrate levels in 22 large rivers across the Nation have changed during the past 65 years. Despite the stabilization of nitrogen inputs in recent decades, there is no evidence of widespread decrease in nitrate levels in rivers. Nitrate levels in large U.S. rivers increased up to fivefold from 1945 to 1980 in intensively managed agricultural areas of the Midwest. 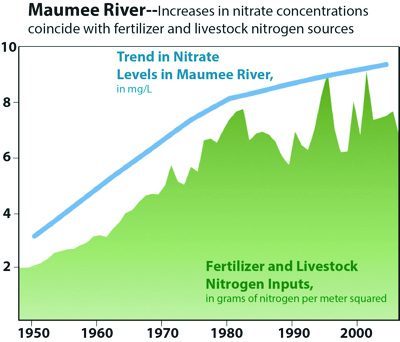 The greatest increases in river nitrate levels coincided with increased nitrogen inputs from livestock and agricultural fertilizer, which grew rapidly from 1945 to 1980. In some urbanized areas along the East and West coasts during the same period, river nitrate levels doubled. Since 1980, however, nitrate changes have been smaller because the increase in fertilizer use has decreased in the Midwest and large amounts of farmland have been converted to forest or urban land along the east coast. The USGS study includes rivers flowing into the Great Lakes and coastal waters such as Long Island Sound, Delaware River estuary, Chesapeake Bay, San Francisco Bay, and the Gulf of Mexico. High nitrate levels can lead to the formation of zones of low oxygen in coastal waters, which harms fisheries, recreational use, and ecological habitat, causing major economic impacts. High nitrate levels also pose a threat to drinking-water supplies, sometimes resulting in high water-treatment costs. Long-term monitoring of water quality is essential to track how changes in land use, climate, and water-quality management actions are affecting local streams and rivers and valuable commercial and recreational fisheries in estuaries across the Nation. The USGS National Water-Quality Assessment (NAWQA) Program is working on a comprehensive assessment of nitrate trends from within the past 10 to 40 years at almost 500 small and large river sites across the Nation. The USGS Hydrologic Research and Development and NAWQA Programs supported this study. Stets, E.G, Kelly, V.J., and Crawford, C.G., 2015, Regional and temporal differences in nitrate trends discerned from long-term water-quality monitoring data: Journal of the American Water Resources Association, v. 51, p. 1394–1407, doi:10.1111/1752-1688.12321. Predicting Pesticide Levels in Streams and Rivers—Where is Water Quality at Risk?